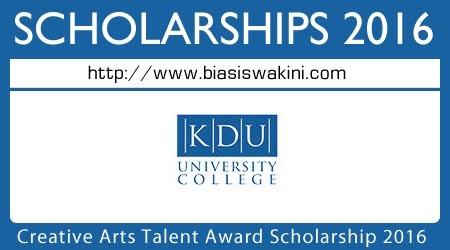 The Creative Arts Talent Award 2016 is open to students applying for the Diploma in Entertainment Arts or Diploma in Entrepreneurial Design programmes in KDU University College. - Applicants must have completed their SPM with minimum 3 credits (or equivalent). - Applicants are required to submit work portfolios to be considered for this Talent Award. - Applicants will need to include a one-page (200 words) statement of their interest in pursuing either -Entertainment Arts or Entrepreneurial Design. - Applicants are encouraged to submit their work online or in soft copy. It is critical that high quality digital images are submitted in PDF format. - Applicants are required to submit one full body photograph and a head profile shot. - Students with expressive performance skills, and who demonstrate high levels of creativity and passion in performing arts, are highly encouraged to apply. - Students with a strong design sense, who demonstrate high levels of creativity with conceptual ideas and technical ability, are highly encouraged to apply. - Applicants are required to submit a portfolio online or of their actual work (depending on the area requirement stated in the guideline). - Only successful applicants will receive a notification letter from KDU University College. The scholarship committee’s decision is final and any appeal will not be entertained. - The scholarship is only valid for the programme in which the recipient has enrolled in and for the original duration of study in KDU University College, Selangor only. In the event the recipient changes programme or transfers to another KDU campus in Malaysia, the scholarship will be terminated. 0 Komentar untuk "Creative Arts Talent Award 2016"